I absolutely love this sink. 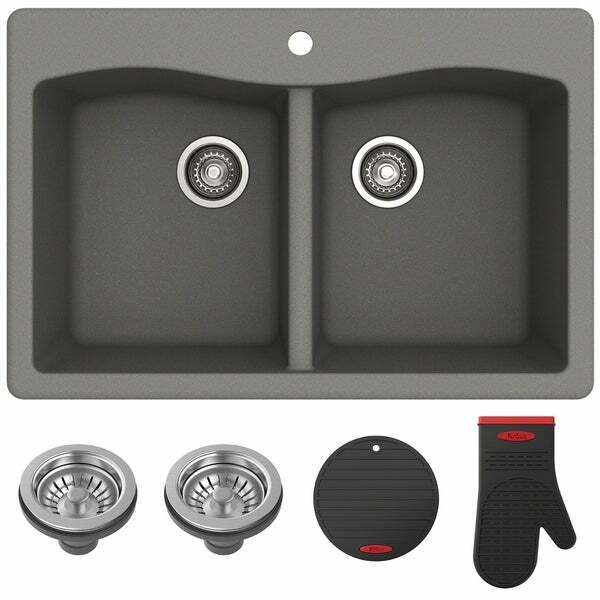 It replaces a stainless steel two-bowl sink which was okay as the stainless steel one was about same size and insulated (unlike most stainless steel sinks). I have been shopping for a few months to get a new sink and this one is the "cat's meow". Nice deep bowls, easy to keep clean and I just love it. Upgrade your kitchen with a striking sink from the Forteza Series, featuring a robust construction and the luxurious look of real stone. A proprietary granite composite offers durability and a rich, consistent color that will not fade over time. Dimensions 33.0 In. X 22.0 In. X 9.69 In. AMAZING! This sink is exactly what i was looking for. I always go with the Kraus brand, and was delighted that they had this sink in gray color. Ties in perfectly with my kitchen, and has received many compliments from friends and family. Very sturdy, packaged extremely well, and excellent quality. I definitely recommend this sink. Completed the modern look of the kitchen, and adds a contrast between the white quartz counter tops. Glad I found it. This sink looks fantastic in my newly remodeled kitchen. The sinks have more depth but were easy to install (except for the weight- very heavy). I love them and couldn't have made a better choice. Was totally satisfied with my purchase of the Granite Kitchen Sink. 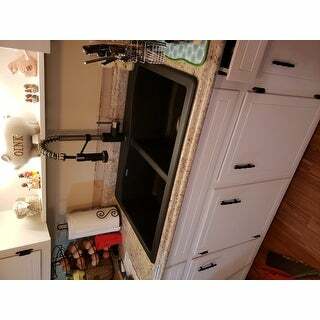 The color was a perfect match to the new appliances and the sparkle in the granite sets it off perfectly. And as an extra "bonus" I saved money on the price as well as the free shipping (which I might add was exceptionally fast). I am looking forward to this being a part of my new kitchen for many years to come. this sink is awesome, i love the color and the quality. It looks great with the new granite counter top. We also ordered the long neck faucet to give it even more grandeur. There is nothing about this sink to dislike. It is very high quality and I simply love that it is so heavy. I also love the stoppers that come with it . They are the best I have ever owned. This sink is a eye catcher for any kitchen. The sink looks great and is very sturdy. 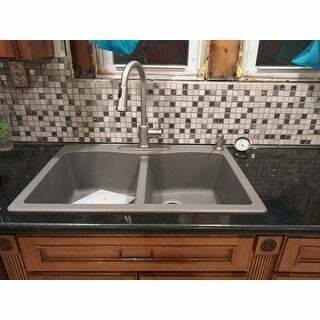 I really like the little glitter specks in the granite and can’t wait to replace it with our plain white, porcelain sink! Love this sink its everything I expected and more. Product came just as described would definitely recommend to a friend. I like the color. It really updates our kitchen. I would recommend it to a friend. Love this sink! It looks so elegant with the quartz countertops and I love that it won’t scratch up like stainless sinks do! Great price too! Haven’t installed yet so will edit when it’s installed. For now it’s a 5. It’s in the box. "it says you can choose color for the stoppers where do I put which color I want"
This sink only comes with one style/color of drain. I hope it helps. Reliability of Kraus brand name, and excellent customer service. Friends who have this sink have enjoyed its durability and style. Heat resistant and scratch resistance are qualities that will help in my kitchen. I am the one who cooks in the house, and this sink will last for a while, and make the kitchen stand out. Reviews online, the look, and research concerning the brand.